About 1740 Birth of Abraham Hiestand: Abraham was born in about 1740 (probably in Hempfield Township of Lancaster County, PA), as the third child of Heinrich Hiestand. Source: Page 130 of Hiestand Family of Page County, Virginia by David B. Trimble (San Antonio, TX, 1974). About 1743 Moved to Frederick (now Page) County, VA: Abraham lived on his father's farm in then-Frederick (now Page) County, VA.
About 1763 First Marriage: Abraham Hiestend married Magdalene Boehm in about 1763. * Magdalene was the oldest daughter of Samuel & Elizabeth Boehm of Shenandoah County, VA.** Samuel Boehm was one of the Swiss Mennonites living in Shenandoah County, VA who petitioned Dutch Mennonites for help on September 7, 1758. Source: Pages 130* & 257** of Hiestand Family of Page County, Virginia by David B. Trimble (San Antonio, TX, 1974). February 4 300 Acres Assigned: Abraham Hestant was assigned 300 acres from David Clem of Frederick County. Was this the original transaction and the survey was made on October 5, 1763? See below. Source: (?) Page 11 of Volume III (1710-1780) -- Abstracts of Virginia's Northern Neck Warrants & Surveys Dunmore, Shenandoah, Culpepper, Prince William, Fauquier & Stafford Counties compiled by Peggy Shomo Joyner (Portsmouth, VA: self published, 1986). October 4 VA Land Surveyed: On this date, Abraham had 300 acres surveyed at the upper end of Powell's Fort in VA, above the Massanutten Path, although Lord Fairfax rejected this claim. Apparently, he intended to purchase this land from David Clem. Sources: Page 130 of Hiestand Family of Page County, Virginia by David B. Trimble (San Antonio, TX, 1974). Also, Joyner, Northern Neck Warrants and Surveys, Shenandoah County, Vol. III, p. 31; Dunmore County, p. 11. Source: Page 131 of Hiestand Family of Page County, Virginia by David B. Trimble (San Antonio, TX, 1974). About 1764-1766 Birth of Probable Son, Samuel: Samuel Hiestand married Elizabeth ____. He lived in (1) Washington Co, NC/TN in the 1780s and very early in the 1790s, (2) Jefferson Co, NC/TN in 1792 (which, at that time, included what became Sevier & Cocke counties) and later (3) in Barren Co, KY in 1810 (part of which became Monroe County in 1820). It would be fitting for Abraham & Magdalene to have had a firstborn son named "Samuel," since Magdalene's father was Samuel Boehm. See more about this Samuel Hiestand. Note: The 1974 book (page 130 of Hiestand Family of Page County, Virginia) by David B. Trimble says c1766 and his 2002 book (Hiestand of Virginia) says c1764 . About 1768 Birth of Son, Abraham: Abraham Hestand (Jr.) was born in about 1768. On April 23, 1814 he gave power of attorney to Joel Moore to receive an inheritance from the estate of Magdalene Boehm (mother-in-law of Abraham Hiestand & wife of the late Samuel Boehm) of Virginia. This son, most likely, was named after his father. About 1770 Birth of Son, Daniel: This Daniel Hestand was born in about 1770. This son of Abraham, although several years younger than the Daniel Haston who settled in White Co, TN, has often been confused for the White County "Daniel." Abraham's son, Daniel, moved about in what became east TN with his father and later settled in what is now Monroe County, KY. It is likely that Abraham & Magdalene named this son after Abraham's brother, Daniel (who was very possibly the "Daniel Haston" who lived in White Co, TN). Even though this Daniel was Abraham's "kid brother," Abraham seems to have been closer to him than he was to his older brothers Jacob & Peter, or to John who was younger but closer to Abraham's age. They lived near each other in Dunmore Co, VA in 1775 and (apparently) moved together to the area that area of NC that became TN. Read more about the Daniel Hestand of Monroe Co, KY (Abraham's son). Source: Page 130 of Hiestand Family of Page County, Virginia by David B. Trimble (San Antonio, TX, 1974). Also, an entry for Joshua K. Hestand of Monroe Co, KY in A History of the State by Battle, Perrin, & Kniffin (3rd Edition, 1886) states that Daniel Hestand "died in 1858, at the age of eighty-three years." It also says that he located in Monroe County, KY in 1799. Question: Why is there no record of Daniel Hestand as an heir to part of the Samuel & Magdalene Boehm estate? Was his power of attorney document lost or destroyed? Or, does it exist and we do not know about it? He was the only one of Abraham's & Magalene's "for sure" known children for which we have no record of an inheritance from his maternal grand parents. We have no such record for Samuel Hiestend, but his relationship to Abraham & Magdalene is not certain. May 26 Road Crew: Abraham Hawting (probably Hasting, based on names of others involved) and Jacob Burner, Peter Clem, and Samuel Stover were ordered to "view the road from near Jacob Ruddle's on South River leading through Stony Creek Gap to the Narrow Passage and report the conveniences and inconveniences attending the said way..."
Source: Page 69 of 1772-1774 Order Book for Shenandoah County, VA abstracts compiled by Amelia C. Gilreath (Nokesville, VA: self published, 1986). June 23 Road Crew: Abraham Kaiston (probably Haiston, see March 26, 1772 entry) and Jacob Burner and Teter Clem were ordered to "view for a road from Massanutten Mountain up Smiths Creek to the County line...have viewed the road and find same as we have marked it...will be prejuditial [sic] to no person...is convenient and necessary..." Walter Newman was appointed overseer. Source: Page 14 of 1772-1774 Order Book for Shenandoah County, VA abstracts compiled by Amelia C. Gilreath (Nokesville, VA: self published, 1986). June 23 Road Crew Report: Abraham Kaiston, Jacob Burner, and Teter Clem made their report regarding the May 26, 1772 order regarding a road "near Jacob Huddleson...the South river through Stony Gap to the Narrow Passage Creek." They ordered the road to be opened. Source: Page 15 of 1772-1774 Order Book for Shenandoah County, VA abstracts compiled by Amelia C. Gilreath (Nokesville, VA: self published, 1986). February 19 Road Crew Overseer: Abraham Haisting is "appointed overseer of the road in room of Caleb Odell." Source: Page 3-4 of 1772-1774 Order Book for Shenandoah County, VA abstracts compiled by Amelia C. Gilreath (Nokesville, VA: self published, 1986). June 23 Court Witness: Abraham Kaiston undertook for Michael Moore (plaintiff) in the case, Michael Moore v. William Speare. Speare did not show up and Moore won the case by default. Source: Page 108 of 1772-1774 Order Book for Shenandoah County, VA abstracts compiled by Amelia C. Gilreath (Nokesville, VA: self published, 1986). November 25 Paid for Killing a Wolf: Abraham Keiston was paid 200 (in tobacco?) by the county "for hitting one old wolf." Source: Page 184 of 1772-1774 Order Book for Shenandoah County, VA abstracts compiled by Amelia C. Gilreath (Nokesville, VA: self published, 1986). May 24 Replaced as Road Crew Overseer: Abraham Heaston was replaced by John Denton as the overseer of a road. Source: Page 188 of 1772-1774 Order Book for Shenandoah County, VA abstracts compiled by Amelia C. Gilreath (Nokesville, VA: self published, 1986). Original page 278. May 24 Co-Supervisor of Road Crew: Abraham Heaston, and Zachary Campbell, were appointed overseers of a road between Barneby Eagon's ford to the Dutch road by John McEnturff's. Source: Page 189 of 1772-1774 Order Book for Shenandoah County, VA abstracts compiled by Amelia C. Gilreath (Nokesville, VA: self published, 1986). Original page 279. May 29 Militia List: Abraham Haston* - On "A list of men living in the lower district of Dunmore County under the command of Capt. Joseph Bowman," the name of Abraham Haston appears, but not the name of Daniel Haston. Could not find a date for this roster, but the list includes many men from Powell's Fort. Why was Daniel's name missing? *Note: This may be the first time the surname of this family was spelled "Haston." The reference to only one female in the Abram Heaston household on the 1775 census record does not seem to match the information regarding the birth dates of the female children mentioned on page 130 of David B. Trimble's 1974 book, Hiestend Family of Page County, Virginia or the reference to Regina Hiestand (born c1766) in his 2002 book, Hiestand of Virginia. Samuel & Magdalene Boehm estate documents clearly indicate that Elizabeth Lemmon, Barbara McFarrin, Anna Gimlin, Magdalene Lemmon, and Mary Moore were daughters of Abraham & Magdalene Hiestand. Where were they at the time of the 1775 census? Source: Mss3 D9217 a 16-20, Dunmore Co, VA Committee of Safety from VA Historical Society. (or shortly after) Purchased Salt as Member of Dunmore County Militia: Abraham Hiestandt purchased salt as a member of the Dunmore County, VA militia. None of the other Hiestand names appear in the account. Does this mean that Abraham was an active militia man and not just on the list because he was within the area from which the unit was mustered? See the May 29, 1775 entry. Does this mean that his brother, Daniel, was not active in the militia? Or was not living within the Dunmore County militia area at the time? Source: "Purchasers of Salt in Old Dunmore County, Virginia, 1776" by William Twyman Williams in The Virginia Magazine of History and Biography Vol. 49, No. 4 (Oct., 1941), pp. 342-350. Salt was very important on the American frontier. Salt was a necessary component of preserving meat, preparing food, and feeding livestock. To put economic pressure on Great Britain, Virginia banned the importation of salt from Britain in 1774. Merchants began hoarding salt and salt prices escalated. Virginia farmers began to suffer from a shortage of salt and salt riots broke out. In 1775, the Virginia Committee of Safety sought to increase the availability of salt by allowing a free market, but price controls were imposed in 1776. Source: Virginia Gazette, December 8, 1775. About 1776 Birth of Son, Henry: Henry Hestand was born in about 1776. On April 23, 1814 he gave power of attorney to Joel Moore to receive an inheritance from the estate of Magdalene Boehm (mother-in-law of Abraham Hiestand & wife of late Samuel Boehm) of Virginia. This son was probably named after Abraham's father, Heinrich Hiestend. January 21 Living Near Head of Passage Creek: Daniel Hestant/Heston and Abraham Hestant were living adjacent to Teter Clem's 141 acres near the head of Passage Creek in Powell's Big Fort. It is not clear if the identification of Daniel and Abraham's location should be associated with the October 11, 1776 or the January 21, 1778 date. Since this is a record of a survey we assume it would be the former date, but that is not clear in the abstract. Source: Page 4 of Volume III (1710-1780) -- Abstracts of Virginia's Northern Neck Warrants & Surveys Dunmore, Shenandoah, Culpepper, Prince William, Fauquier and Stafford Counties compiled by Peggy Shomo Joyner (Portsmouth, VA: self published, 1986. March 26 300 Acres Entered into Grant Book: Abraham Hestant's 300 acres on the upper end of Powell's Fort above the Massanutten Path in Dunmore County was entered into the grant book. The land had been surveyed for Abraham Hestant on October 4, 1763 (Book N). The land was adjacent to Henry Hestant's tract. Source: (Q-99) Page 6 of Virginia Northern Neck Land Grants, Volume III 1775-1800 compiled by Gertrude E. Gray (Baltimore: Genealogical Publishing Company, Inc., 1993). January 12 Death of Abraham's Mother: According to her son Peter's Bible record, the wife of Henry Hiestand died on this date. Source: Peter Hiessandt's (Sr.) Bible record. March 26 Granted 300 VA Acres: Four days after Henry Hiestend's will was made out, Lord Fairfax granted Abraham 300 acres, which adjoined his father's farm. He purchased it from David Clem. May 18 Living Near Teter Clem (Powell's Fort Valley): Daniel Heston and Abraham Heston were living in Shenandoah County adjacent to Teter Clem's 141 acre tract. David Clem was also living on land adjacent to Teter Clem. Source: (R-209) Page 34 of Virginia Northern Neck Land Grants, Volume III 1775-1800 compiled by Gertrude E. Gray (Baltimore: Genealogical Publishing Company, Inc., 1993). October 5 Death of Abraham's Father: According to the Bible record of Abraham Hiestand's brother, Peter, their father, Henry Hiestand, died on this date. October 31 Purchased 50 Acres in Washington County, NC/TN: The land was surveyed five years later, on October 30, 1784 for "Abram Heston" and the warrant was issued by John Carter. Sources: #2102 - Tennessee Land Entries: Washington County 1778-1796 by A.B. Pruitt (976.87 - East TN Historical Society). Grant: see file #652 in Washington County. MARS 12.14.20.655. About 1782 Birth of Daughter, Mary: Mary Hiestand married Thomas Lee on June 25, 1800 in Barren Co, KY. Abraham had a sister named Mary Magdalene and his wife, Magdalene, had a sister named Mary. This daughter could have been named for either of those. On April 23, 1814 she gave power of attorney to Joel Moore to receive an inheritance from the estate of Magdalene Boehm (mother-in-law of Abraham Hiestand & wife of late Samuel Boehm) of Virginia. March 29 Abraham's Place Mentioned in a Road Order: Abraham Heastants place is mentioned in a road order: "On motion of Henry Reddenour the road leading from Abram Heastants to Henry Funks to go by John Woolards from thence to the sd. Reddenour..."
Source: Page 3 of Order Book 1781-1784 Shenandoah County, Virginia (Abstracted) compiled by Amelia C. Gilreath (Nokesville, VA: self published, 1987). May 29 Abraham's Place Mentioned in a Road Order: Abraham Heastings was mentioned in a road order: "Ordered that John McInturf be overseer of the road from the widow of Ailshite's to Abraham Heastings instead of Jacob Burner..."
Source: Page 78 of Order Book 1781-1784 Shenandoah County, Virginia (Abstracted) compiled by Amelia C. Gilreath (Nokesville, VA: self published, 1987). July 15 Jury Duty in Washington County: Abraham Hastings served on a jury in Washington Co, NC/TN on this date. Source: WPA page 193 (original page 401) of WPA transcriptions, Tennessee Records of Washington County County Court of Pleas and Quarter Sessions, Volume Book #1, Section 1: 1778-1785. *Page 116 of Massanutten: Settled by the Pennsylvania Pilgrim - 1726 by Harry M. Strickler (1979 reprint). August 27 Release of Powell's Fort Valley Land: The August 22, 1783 deed was released. Both "Abram Hestant & Molly, his wife of Shanado County" are mentioned in this document. August 28 Father's Will Proved in Court: Although Heinrich Hiestand died on October 5, 1779, according to Peter Hiestand's Bible record (Heinrich's son), his will was not proven in court until this date. Source: Pages 2-4 of Shenandoah Co, VA Will Book B. This was about the time that Abraham and Daniel Hiestand/Haston moved to what was then North Carolina (later to become east Tennessee). The final settlement of their father's will was probably the marker event that made them feel free to leave their home area. Also, see the April 26, 1783 entry on Daniel Haston's timeline. The North Carolina Land Act (or "Land Grab Act") of 1783 went into effect on October 20, 1783. September 4 Cherokee Creek Baptist Church Covenant: Magdelen Hasting (probably the wife of Abraham Hiestand/Hasting/Heaston) signed a covenant in the Cherokee Creek Baptist Church (source page 167). Earlier (page 69) in the same source, it is said that Magdalen Hasting and Daniel Hasting were some of the early members. Apparently, as per page 167 of the source, the church minutes begin with April 2, 1783 (although page 69 of the source says 1782). Source: Pages 69 & 167 of History of Washington County, Tennessee (1988), compiled by the Watauga Association of Genealogists Upper East Tennessee. Sources: Original copy of Hamilton District Superior Court Docket 27/35, Robert McCombs vs Abraham Heiston, available in the Knox County, TN Archives in Knoxville, TN. Also, pages 36-37 WPA transcriptions titled Hamilton District Superior Court Book of Record - 1794-1797 (976.87). See October 31, 1779 entry above. September 25 Purchased Washington Co, NC (later TN) Land: Perhaps with the money earned on the sale of his VA land, Abraham bought 123 acres on both sides of Cherokee Creek from James Ray for 100 pounds (Ray's original grant of 10/24/1782). This land was adjacent to William Murphy. William Murphy, John Tipton, and Henry Reagan witnessed the deal. Sources: Pages 66-68 of Washington County (NC/TN) Deeds, Volume 2, 1784-1792, TSLA microfilm #195. Page 130 of Hiestand Family of Page County, Virginia by David B. Trimble (San Antonio, TX, 1974). Also, pages 62-63 of Washington Co, TN Deeds, 1775-1800, compiled by Loraine Rae. October 26 Purchased 50 Acres: Abraham Histon received an additional 50 acres on the south side of Cherokee Creek (in Washington County) from the state of North Carolina for 25 shillings. This land had been entered by James Wray and was adjacent to William Murphy. Sources: Pages 52-54 of Washington County (NC/TN) Deeds, Volume 5, 1790-1797, TSLA microfilm #196. Page 130 of Hiestand Family of Page County, Virginia by David B. Trimble (San Antonio, TX, 1974). Also, page 100 of Washington Co, TN Deeds, 1775-1800, compiled by Loraine Rae. Note: There is no record of Abraham selling the land, although the 123 acres tract did end up in the ownership of John Tadlock who sold it to Peter Rube on August 27 of 1793. Source: Page 113 of Washington County, TN Deeds (1775-1800), compiled by Loraine Ray. See also pages 62, 63, & 100 for the other Abraham Hiestand deed entries. 1789 or 1790 Washington County Tax List: Abram Hasting owned 177 acres and was taxed for one white poll. Source: Page 80 of Volume 5 (2) of Tennessee Ancestors. Available at McClung Historical Collection in Knoxville, TN. June Member of Cherokee Baptist Church: Various members of the Abraham Hiestand family were active in the Cherokee Creek Baptist Church in Washington County, NC (later TN, near Jonesborough, NC/TN). Source: Washington County, TN Cherokee Baptist Church minutes, 1787-1923, microfilm AC #523 (McClung Historical Collection, Knox County, TN). Note: The microfilm copy of the Cherokee Creek Baptist Church is very difficult to read. It has not been transcribed. Some of the names that appear there for sure are Betty Heaston, Ann Heaston, Daniel Heaston, Magdalene Heaston, and Abram Heaston. 1791 Washington Co, NC Tax List: A tax list for Captain North's Company in Washington County, NC (later TN) includes the names of Abraham Heslin, junr, Samuel Hestain, and Abram Heeslin, senr, who had 223 acres. Source: Washington Co, TN microfilm roll #639 for 1778-1846 tax lists (available from TN State Library and Archives). Note: A Daniel Heston voted in Washington County, TN in 1786 and was on a tax list there in 1787. He does not appear on this 1791 tax list for Washington County. See the 1787 entry of the Daniel Haston timeline for details. About 1792 Moved to Jefferson (now Cocke) County, TN: Abraham sold both tracts of his Washington Co, TN land and moved to what is now Cocke Co, TN (Jefferson County at that time). Source: Hiestand of Virginia by David B. Trimble (about 24 copies privately published in 2002 by David B. Trimble, 2506 Hartford Road, Austin, Texas 78703). Note: Did Abraham remove himself and his family from Washington County in order to evade the legal consequences of his 1790 financial obligations to John McRavey and Robert McCombs? The area where Abraham's family moved was Indian land (not part of NC or TN) until June 11 of 1792. Four days after this area was included in the new Jefferson County, NC/TN, Abraham (Sr.) joined the Big Pigeon Baptist Church. At least some of his family were in that area several months prior to its inclusion into a state of the USA. Member of Big Pigeon Baptist Church: This same Abraham Hiestend/Heaston family joined and became active in the Big Pigeon Baptist Church, which was located in the part of Jefferson County, NC/TN that later became Cocke County, TN. This church was approximately 50 miles south west of Jonesborough, TN, which was a little over half way to Knoxville. See information regarding the location of the Big Pigeon Baptist Church and information regarding its distance from where Abraham Hiestand was said to have lived in 1793, on the Little Pigeon River. Note: Ann Heaston, Betty Haston, Maagelean (and Magdeleum) Heaston, Abrm. Measton, Sr. (probably the older brother of Daniel Hiestand of Page Co, VA), Daniel Heaston/Haston (probably Abraham's son), Abram Heaston/Haston (probably Abraham, Sr.'s son) appear in the minutes of the Big Pigeon Baptist Church of the area that became Cocke County, TN. Also, Regina Heaston Moore was a member of that church. These minutes have been transcribed and are available on the Cocke County, TN RootsWeb site. 1793 Washington Co, TN Tax List: The name "Abram Heslan" (probably Abraham Hiestend) appears on the tax list for Captain North's Company. He owned 100 acres. 1793 Washington Co, TN Delinquent Tax List: Abraham Heston's name appeared on a delinquent tax list in Washington Co, TN (NC at that time). He owed 75 cents. Source: Delinquent records from Washington Co, TN tax records of this era (from a TSLA microfilm of tax books; list of delinquents follows records of those who paid). Apparently Abraham made a deal with John McRavey for the land on September 30, 1784 and was supposed to pay for it on or before September 30, 1790. This land probably would have been in Washington Co, NC/TN, since Abraham had likely arrived in that county at the time the deal was transacted. His name was spelled "Heistant" on the 1784 real estate agreement document. James Whitson was Abraham's security in this case. Abraham Hiestand, Jr. also witnessed the deal (his name was signed in German). Abraham had to pay $262.91 & 1/3 cents, plus $30.91 for court costs. The judgment was given in the April 1794 term and Abraham was summoned to appear and pay in the October 1794 term. A note of one of the docket documents says: "The Deft. is supposed to live on little Pidgion [sic] River." Now, the Little Pigeon River flows out of the Great Smokey Mountains National Park and into Sevierville, TN (Sevier Co, TN). It is located about 15 miles south west of the Big Pigeon River. Abraham lived in the area that became Sevier Co, TN. The Big Pigeon Baptist Church was located near the point where English Creek flows into the Pigeon River, on the east side of the town of Newport, in Cocke Co, TN (about 2 miles west of the Cherokee National Forest). February 9 Jefferson Co, NC/TN Bill of Sale: "A bill of sale from Abraham Hasten to Daniel Hasten was proven in court and recorded" in Jefferson County, NC/TN (just a few miles east of Knoxville). Was this "Daniel" Abraham's son or his brother? The earliest record we have of "Daniel Haston" (who later lived in Knox & White counties of TN) in Knox County was the summer of 1795. Thus, it is possible that Abraham sold some kind of items to Daniel Haston who moved to Knox County sometime during the next few months. On the other hand, Abraham's son, Daniel, completed three months & four days of military duty in the Cherokee wars on December 3, 1793 and was married about that time. Perhaps he was buying things from his father in order to establish his home. Sources: Original page 43 (transcribed page 22) of Jefferson County, NC/TN Minute Book, 1792-1798. Page 14 of transcription by James L. Douthat & Roberta D. Hatcher, published in 1985 by Mountain Press. Source of Daniel Hestand's military record: National Archives Military Service Records for Daniel Hasten/Heaston of North's Company, Christian's Regt. Territory South of the Ohio in the 1790s Cherokee Wars (indicate the Daniel Hestand who died in Monroe Co, KY). Note: A Daniel Hasten served on juries in Jefferson County in 1797 (same Jefferson County source as above). This was probably Abraham's son, Daniel Hiestend, and not the Daniel Haston who moved to White County later, nor the Daniel Haston who settled in Adair County, KY prior to 1807. In 1797, Jefferson County was a smaller area that it have been previously. Sevier and Cocke counties had been created out of Jefferson County by 1797. Thus, the Daniel Hasten of this jury, apparently, was not living where Abraham Hiestand had lived, on the Little Pigeon River in what became Sevier County. See map. October Unclaimed Mail in Knoxville: Abraham Heaston of French Broad had unclaimed mail in the post office at Knoxville. The "French Broad" was the same general area where the Big Pigeon Baptist Church was located. The Big Pigeon River flowed into French Broad River a mile or so from the church. In those days, the mail recipient paid the postage and often mail went unclaimed (sometimes because the recipient had no money with which to pay the postage). Sources: Page 78 of Tennessee Today 1796, edited by James L. Douthat and published in 1996 by Mountain Press. Also, November 14 & 21, 1796 issues of the Knoxville (TN) Gazette. Note: The Little Pigeon River, where Abraham Hiestand was supposed to have lived in 1793, was about 15 miles away from the French Broad. See map of that area. March 30 Abraham Hiestand family left Big Pigeon Baptist Church: Rev. John Mulkey and his brother Philip Mulkey were members of the Big Pigeon Baptist Church while Abraham Hiestand and his family were members there. 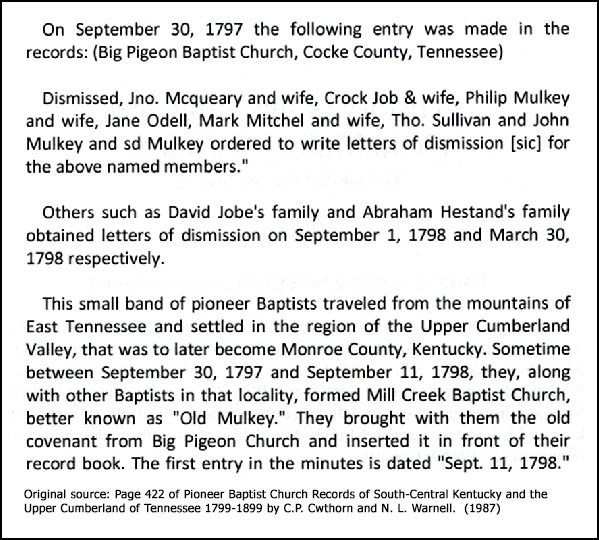 The Mulkeys left the Big Pigeon church on September 30, 1797 and moved to what is now Monroe County in south-central Kentucky, where they started the Mill Creek Baptist Church. Six months later (March 30, 1798), Abraham Hiestand ["Hestand" was the spelling adopted in Kentucky] left the Big Pigeon church and moved to the same area of south-central Kentucky. On September 11, 1798, as per the church minutes, it appears that the Mill Creek Baptist Church of then-Barren County (now Monroe County), Kentucky was officially organized. Three years later (April 1801), Abraham Hiestand joined Rev. Mulkey's Mill Creek Baptist Church in Kentucky. June 14 Green River Area of South Central, KY: Abraham claimed 200 acres of second rate land on Green River, by virtue of a certificate for settlement #744. (He had surveyed 100 acres on Green River.) This 200 acres of land began "at Deskin Gibbs lower corner thence down the river to the cliff thence to Nathan Austins out corner thence to the river thence down the river to Tibbs line & with the same to the beginning." Sources: Page 130 of Hiestand Family of Page County, Virginia by David B. Trimble (San Antonio, TX, 1974). Also, page 200 of Green County, KY Land Entries, 1796-1834. About 1800 As per David Trimble, Abraham moved to Barren (now Monroe) County, KY at this time: Abraham Hiestend moved to Barren (now Monroe) County, KY. Trimble says "about 1800" but we know that it was sometime between March 30, 1798 and June 14, 1799 (see above entries). 1801 Estate Settlement of His Father-in-Law: Abraham appointed Joel Moore as his attorney to receive his share of the estate of his father-in-law, Samuel Boehm of Shenandoah County, VA. The power of attorney document indicates that Magdalene, Abraham's wife, was deceased at this time. Source: Abraham Hestand to Joel Moore, Power of Attorney, June 23, 1801, Barren County, Kentucky Deeds, Volume A, 1799-1809, Book A Page 42. (LDS FHL Film 0209719) Also, page 130 of Hiestand Family of Page County, Virginia by David B. Trimble (San Antonio, TX, 1974). April Joined Mill Creek Baptist Church: Abraham Hestand, Rebekah Wiley (probably not related to the Hiestands), and Regina [Hiestand] Moore joined (by letter) the Mill Creek Baptist Church in Barren County (now Monroe County), KY, near Tompkinsville, KY. The pastor of Mill Creek Baptist Church was John Mulkey, who had been a fellow member with the Abraham Hiestand family in the Big Pigeon Baptist Church in Jefferson/Cocke Co, NC/TN until he was dismissed to move away on September 2, 1797. Note: Page 4 of Mill Creek Missionary Baptist Church of Barren - Now Monroe County, KY (Mill Creek #1 or Old Mulkey) - 1798-1820 by Eva Coe Peden says that the year was 1800, but the original document clearly says 1801. The 1800 date is consistent with the fact that Regina Moore was still at Big Pigeon Baptist Church until at least May 31,1800, when she was given a letter of dismissal. June 18 Sevier County, TN Delinquent Tax List: Abraham Hastand and Abraham Hester were both on the Sevier County, TN delinquent tax list for 50 acres each. Sources: Pages 291-293 of Genealogical Abstracts From TN Newspapers (1791-1808), compiled by Eddleman. Also, July 18, 1803 edition of the Knoxville Gazette (Number 187, Volume 4). Note: Sevier County is near Cocke County, TN & Jefferson County, TN. Apparently, the Abraham Hiestand family abandoned their land in that area when they moved to KY.
1805 Married Second Wife: Abraham apparently married his second wife, Elizabeth. March 7 Four Children Received Boehm Inheritance: In Green Co, KY, Rudien & Elizabeth Lemmon, Barbara McFarrin, Daniel & Anna Gimlin, and John & Magdaina Lemmon gave Joel Moore of Barren County, KY power of attorney to receive their inheritance from Magdalina Boehm (mother in law of Abraham Hiestand & wife of the late Samuel Boehm) of the state of Virginia. Source: McFarrin, Gimlin, Gimlin, Lemmon, Lemmon, Lemmon, Lemmon to Joel Moore Power of Attorney, March 7, 1805, Green County, Kentucky Deed Book, volumes 1-5, 1793-1819, Book 4, page 158 (LDS FHL Film 0551029). June 10 One Daughter Received Boehm Inheritance: In Barren Co, KY, Rheganah (Regina) Moore gave power of attorney to Joel Moore to receive an inheritance from the estate of Samuel Boehm (father-in-law of Abraham Hiestand). Joel Moore was Regina's husband. Source: Rheganah Moore to Joel Moore, Power of Attorney, June 10, 1813, Barren County, Kentucky Deeds, Vols. B-C, 1801-1813, Book C, page 250 (LDS FHL Film 0209720). July 13 Withdrew from Mill Creek Baptist Church: On the second Saturday in July of 1811, Abraham and his wife Elizabeth withdrew from the Mill Creek Baptist Church of Monroe County, KY. Nothing else is known of them. Sources: Page 25 of Mill Creek Missionary Baptist Church of Barren - Now Monroe County, KY (Mill Creek #1 or Old Mulkey) - 1798-1820 by Eva Coe Peden. Page 130 of Hiestand Family of Page County, Virginia by David B. Trimble (San Antonio, TX, 1974). April 23 Three Children Received Boehm Inheritance: In Cumberland Co, KY, Abraham Heastand (Jr.), Henry Heastand, and Mary Heastand Lee gave power of attorney to Joel Moore to receive their inheritance from the estate of Magdalene Boehm (mother in law of Abraham Hiestand & wife of late Samuel Boehm) of Virginia. Abraham and Mary signed with their marks; apparently, Henry signed a full signature. This was nine years after Elizabeth, Barbara, Anna, and Magdalene took the same legal action in nearby Green Co, KY.
Wayne--I visited your website, and found it very interesting. I'm wondering if you know that Abraham Hiestand's father was Henry Hiestand, b 1705 probably in Switzerland, and that they were Mennonites. I am a descendant of Abraham Hiestand--through his daughter Magdalena Hiestand m1 John Lemmon Jr. m2 Jacob Fry/Freye/Frey in Spencer Co IN c1820/27. Magdalena Hiestand and John Lemmon Jr. were my 4th great-grandparents. John. According to legal papers, Daniel Lemmon agreed to pay a sum monthly for the upkeep of the child. Later, Barbara McFarrin m William Smith 19 Jun 1807 Green Co KY. The Hiestands listed are: Abraham; Henry; Henry F. The Hestant listed: Jacob. The Lehmans listed: Abraham; Christian; Frederick; George; Jacob; John; Peter; Peter Jr.; Peter Sr.; and Rudolph. Lemmon researchers are closing in on proving that Lemmon's Bend John was the son of the Rudolph Lehman listed on the York Co PA Colonial Family Name Index. family located there. I got the following info from the book, "History of Mennonites In Virginia, published by H.A. Brunk Harrisonburg, VA., but this is not a direct quote, when these Mennonites abandoned their dwellings and land in Virginia, four of the men that fled back to Pennsylvania wrote to their brethren in Holland asking for material relief, on 7 Sep 1758--one of the signers of this letter was Samuel Boehm . Later I learned that Samuel Boehm was to become the father-in-law of the Abraham Hiestand we have been discussing above. In 1758, Abraham Hiestand b c1740 would have been eighteen years old. Could he be the Abraham Hietand listed in the Colonial Family Name Index? I started on a project several years ago to try and find out the names of the Mennonite families that were involved in the 1758 Indian attack, and I got quite a few of the names, but not all. There was also another attack in 1764. An unscrupulous white man led eight Indians in an attack at the home of John Roads--it was quite brutal also. It was a practice of the British to allow the non-English immigrants to settle the out-skirts of the base of "civilization" in the early history of VA--the British could better defend themselves if the Pennsylvania-Dutch and Scots-Irish took the brunt of an attack. This is why so many Pennsylvania-Dutch and Scots-Irish families were joined by marriage on the frontier--they were the only people available to marry in their local vicinity. My Patton ancestors were attacked at Draper's Meadow in 1755--the frontier was full of terrorism, on both sides. Later the Pattons and Mitts/Metz family inter-married.